by Mary Kathleen Glavich, SND. Twenty-Third Publications (New London, Connecticut, 2017). Orbis Books (Maryknoll, New York, 2017). Tom Zanzig in “The Transformed Heart: Spirituality, Religion and the Struggle for Integrity” and Sister Mary Kathleen Glavich, a Sister of Notre Dame, in “Praying on Empty: A Guide to Rediscovering Your Prayerful Self” provide valuable resources that can help us to grow in our personal prayer lives and help parents and their children in theirs. In 10 brief chapters, Sister Glavich provides insights from the church’s history to help people understand the role of prayer in their lives and offers suggestions from the church’s great saints on what we can do when our prayer lives become dry and barren. She writes in a staccato style, introducing new ideas throughout the chapters, offering a breadth of information in a few words. While this allows her to introduce many ideas, a slower pace and more depth would have been helpful. By providing a reflective prayer and questions at the end of each chapter, Sister Glavich helps to soften the landing from all the ideas. Written primarily for people who struggle to pray, her insights would be of value to anyone seeking to grow in his/her relationship with God through prayer, or who wishes to help others on their faith journey. 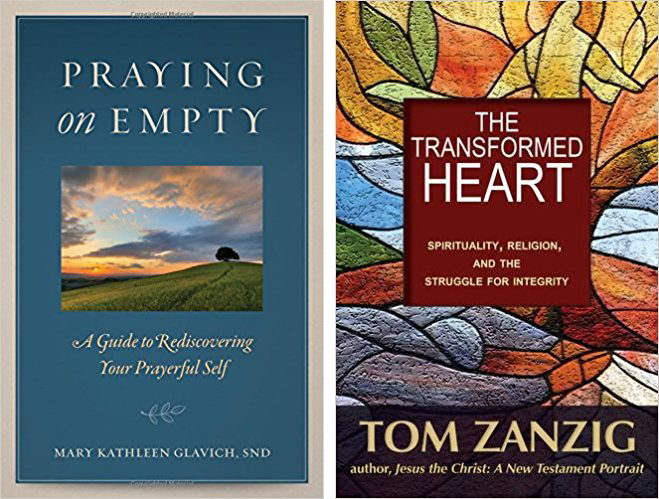 In “The Transformed Heart,” Zanzig has written very personally about his own journey to move from a very static understanding of faith to one that is very dynamic. Over the years, he has reflected on his personal faith journey and has developed the “spiritual growth cycle” as a means to explain the transitions we experience in our spiritual lives. The moments Zanzig names in his growth cycle are: our hungers lead us to search for meaning/answers/solutions, which lead us to “ah ha” moments (awakenings), which then call forth from us a spiritual response. He believes we continue to go through this cycle throughout our lives as we experience new hungers. Zanzig also offers a “spirituality wheel” that describes the various ways we develop wholeness and integrity within our lives. His listing of the major characteristics that take place within each “spoke” of his wheel — the various dimensions — is very helpful for anyone looking to understand what leads us to or away from wholeness and holiness. Zanzig writes in an inviting, friendly style. His stories both reveal his personal journey toward spiritual transformation and help to make sense of his various wheels and cycles. Although none of the stories is inappropriate, many of them are deeply personal, some perhaps offering a little too much information. These stories will certainly spark something in the reader. Although quite different in style and content, these books both plumb the depth of the church’s teaching on spirituality and prayer, and deserve serious consideration by those seeking guidance in their own spiritual journey or wanting to help those who are just beginning the process.